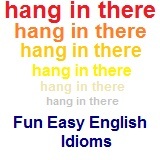 ﻿ Fun Easy English - new american english idioms letter v.
In this lesson you will learn American English idioms beginning with the letter V. You will learn the definition and study the usage of each idiom. very well Okay Very well, you can leave work early. vicious circle unbroken sequence of cause and effect Drinking alcohol, becoming depressed and then drinking even more is an example of a vicious circle. voted down defeated The election results showed the governor was voted down. Hey do you know any English idioms beginning with the letter V not listed on this page?